Tuesdays at 6pm and Sundays at 9am. Shore Road Beach, near Sandbanks. 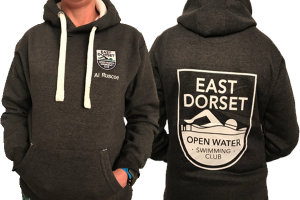 Our club was formed to encourage participation and cater for the growing interest in open water swimming. Members are of mixed ability and include recreational swimmers, triathletes, long distance and cold water swimmers. Do all of your members wear wetsuits? No. Some swimmers choose to wear a wetsuit for all or part of the season while others choose to swim without a suit all year round. Whether you're into rubber or prefer a pair of fur lined speedos, everyone is welcome. We start swimming as a club in April and finish towards the end of October. What range of abilities are there in the club? We cater for a wide range of abilities. We ask prospective members to attend a taster session so that we can assess their abilities and run through basic safety techniques. Safety cover is provided during our Tuesday evening sessions in the form of kayaks paddled by qualified lifeguards. Will I be a fast enough swimmer? There will always be faster swimmer in front of you and slower swimmer behind, at least that applies to all but two of our members! How long do you normally swim for? We normally start swimming after 6pm and carry on until 7:30pm but you're welcome to get out earlier! Please come along to one of our taster sessions so that we can assess your abilities. There's more information on the How To Join page. I'm a competent open water swimmer who's just visiting the area. Can I join you? Yes of course! Come along to one of our sessions. We'd love to meet you. Find out more about guest swimmers. Have a look at our social media and FAQs, or send us an email. Kirstie Foweraker Gets The Call!